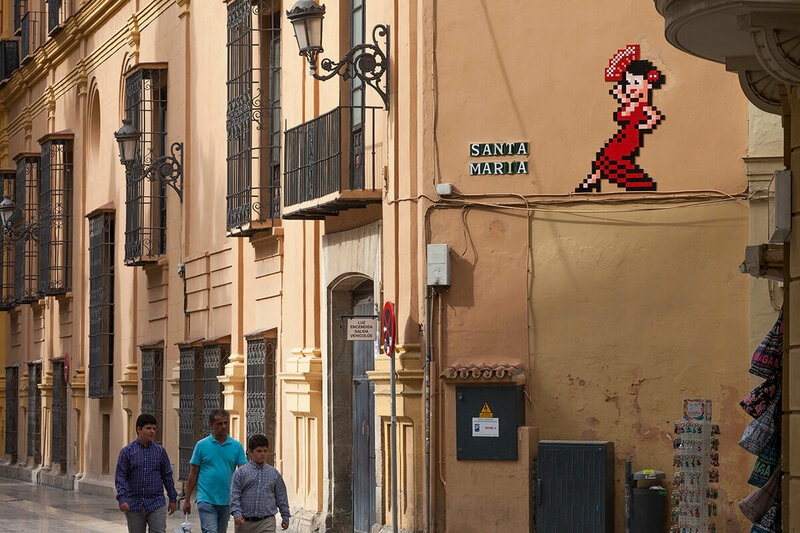 French mosaic artist Space Invader has traveled the world, and placed his street art in over sixty cities in more than thirty countries. He’s been arrested a few dozen times, but says that’s part of the job. Space Invader has chosen to remain anonymous, so the little that is known about his comes from his website and interviews that he has chosen to give. 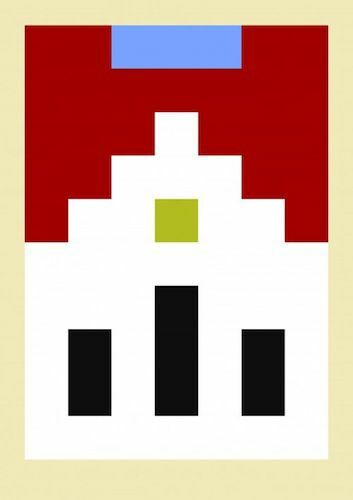 Invader is from Paris, went to school at the Ecole des Beaux-Arts and the Sorbonne. Invader says that only a few people know his real name and his parents think that he works for construction companies as a tiler. Invader’s cousin, Mr. Brainwash, shot Banksy’s film, Exit Through the Gift Shop, featured Invader and his work. Invader’s first tile designs were based on the characters of the Space Invaders video game, although each of his designs are unique and tailored to the city, the building and the context in which it is installed. Many of Invader’s works are partially built in advance to make it easier to install once he gets to a city and decides where he wants to place his work. Most of the locations that he has used were done without the knowledge or consent of the location’s owner, but, a few years ago, Invader has sent out requests, on social media, asking for building owners to allow him to use their sites legally. 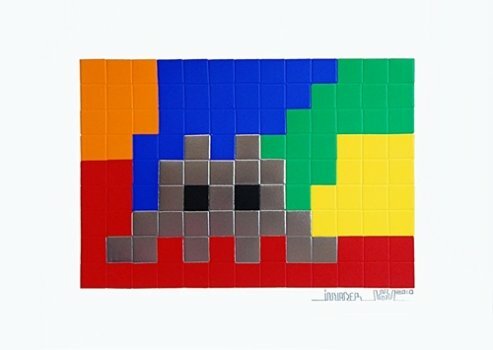 In addition to his tile work, Invader has created works using Rubik’s Cubes and barcode patterns. 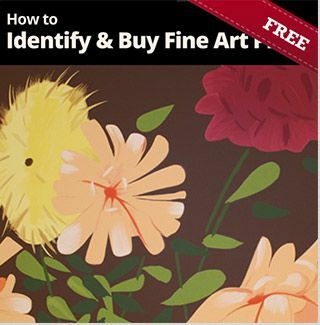 He has had exhibited in galleries in Hong Kong, Paris, New York, Los Angeles, Rome and other major cities, where this works sell in the six-figure range. Space Invader has placed over 3,000 works in 72 cities around the world, including Miami. 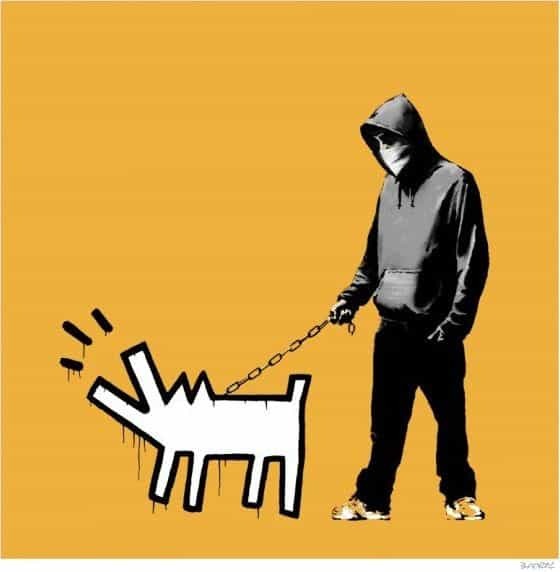 He “invaded” Miami in 2012 and placed his first piece on a wall of the Miami Children’s Museum. The museum staff posted the work on their Facebook page and asked if they should keep it. The response was a resounding, “Yes.” And Space Invader, being Space Invader (he calls himself a UFA, meaning Unidentified Free Artist), went on to put more than two dozen of his signature pixilated mosaic pieces in random and surprising spots around Miami.